Gauhati Medical College & Hospital, Guwahati. Applications are invited in Standard form as published by the Assam Gazetted in Part-X for filling up the following posts of Gauhati Medical College & Hospital, Guwahati in the Scale of Pay and other allowances as shown against each posts. Educational Qualification: HS.S.LC (Science) passed with Computer and D.TP Certificate. Educational Qualification: H.S or equivalent with diploma in Computer application from recognized Govt .Institute with DTP Certificate. Educational Qualification: Degree/Diploma Physiotherapy from Govt. recognized Institute. 4. Multipurpose Technician tor immunization. Educational Qualification: H.S (Science) Passed with diploma In Physician Asstt and Computer knowledge. Educational Qualification: H S Passed 2 Year Diploma in Sanitation horn Govt. Recognized Institute. Qualification: H.S (Science) passed (10+2 Science) with Certificate in Radiography/Medical Radiography from Medical Colleges ot the slate or Diploma in Medical Radiographic Technology of Srimanta Shankardeva University Health Sciences or Equivalent. Educational Qualification: H.S (Science) passed (10+2 Science) with Certificate in Radiography/Medical Radiography from Medical Colleges ot the slate or Diploma in Medical Radiographic Technology of Srimanta Shankardeva University Health Sciences or Equivalent. (i) Diploma n biomedical Mechanics. (ii) ITI Certificate on Biomedical equipment maintenance with training completion certificate in mechanics of X-Ray & ultrasonography machines. (iii) National Trade Certificate in Biomedical Mechanics from Recognized institute with training completion certificate in-mechanics of X-Ray & ultrasonography machines. Educational Qualification: H.S (Sc) Passed or equivalent Training in Orthopedic/Physiotherapy from recognized Institute of Govt. of Assam. Educational Qualification: H.S (Sc) Passed with Training in Orthopaedic/Physiotherapy tram recognized Institute of Govt. of Assam. Educational Qualification: H.S (Science) Passed with 2 years Diploma in Radiography from recognized Institute of Govt. of Assam. Educational Qualification: H.S (Science) Passed with Certificate/Diploma in Laboratory Technician from recognized Institute of Govt. of Assam. Educational Qualification: B. Sc/Optometry with working experience. Educational Qualification: H.S Passed with Computer Diploma (6 months course) with DTP Certificate (3 months course). Age: Candidates should not be less than 18 (eighteen) years and not above 38 (thirty eight) years as on 01/01/2015. The age limit Is relaxable for reserved categories as per rules. Fees: The applications should contain an application fees in the form of Bank Draft drawn in favour of HMS. 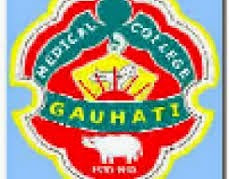 Gauhati Medical College & Hospital. Guwahati of Rs. 150/- (Rupees one hundred fifty) only applicable for General category and OBC/MOBC candidates and Rs. 75/- (Rupees seventy five) only for the SC, ST (P) & ST (H) category candidates. Last Date of Submission of Application: The Form along with required documents shall have to be submitted in the box kept in the office of the Superintendent, GMC&H at Superintendent Office by on or before 5 P.M of 02.11.2015 by hand or by post. However, the undersigned shall by no way responsible for any postal delay or loss. Address for Communication: Application shall be addressed to the Superintendent, Gauhati Medical College & Hospital, Superintendent Office, Guwahali-32, Assam and 'have to be sent/submitted in a sealed envelope to the office of the undersigned on or before 02.11.2015 during office hours. The name of the posts should clearly be mentioned on the top of the envelope. Applications received either by post or by hand after last date of submission shall not be accepted under any circumstances. 1. Interested candidates shall to have tilled up the application forms clearly and legibly and submit with the required documents and Photograph (Colour) duly self-attested: please note that incomplete forms shall be summarily rejected. 2. Documents required are : (a) 2(two) copies of recent passport size colour photograph duly sell attested, (b) H.S.LC admit card or birth certificate for age proof (c) All mark sheets and passed certificates, (d) Caste certificate ( where applicable), (e) Permanent residentship certificate. (f) Employment Exchange Registration certificate, (g) Certificate of training experience. Extra Curriculum etc. Candidates not fulfilling requisite minimum qualifications shall be rejected. 3. The name of post applied tor must clearly be marked on the TOP of the envelope. Envelopes which do not have the name of posts applied writing on the top shall not be opened and entertained. 4. The authority will decide for holding the written test for the post in addition to interview depending upon the number of candidates as per rule. 5. No Individual communications shall be sent to the eligible candidates. Detailed list of eligible candidates for the posts along with details of interview timings shall be notified in due time and shall be published in the news papers for information of the eligible candidates. 6. The advertiser retains the right to correct any inadvertent or typographical error.